The goal of shocking a pool is to increase the available chlorine levels in the pool so that the chlorine can act to disinfect organic contaminants and bather waste. The process of adding chlorine as part of a pool shock treatment breaks down any combined chlorine or chloramines in the pool water to achieve a breakpoint chlorination point. Here are the steps to take to shock a pool. 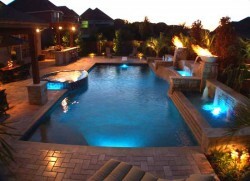 1) Ensure you purchase the right shock treatment for your pool. If you are using chlorinated pool shock then check for the available chlorine levels. A 65% level is typically used for normal shocking. Some pool users use non-chlorinated shock as this means the pool has less down time and there is less risk of bleaching delicate surfaces. 2) Read the manufactures instructions carefully when it comes to dosage. You’ll also need to know the levels of combined chlorine in the pool and the size of your pool in gallons. 3) Before you add the pool shock, make sure you have removed any pool accessories, such as pool floats from the pool. Also check that there is no debris (such as leaf waste) in the pool skimmers, filters or on the pool floor. 4) Broadcast the pool shock in the deep end of the pool keeping the filters running so that there are no dead spots. If you have only used part of one container it’s best to dispose of this rather than store for using at a later date. 5) If using chlorine shock, don’t allow swimmers back into the pool until the chlorine has returned to safe levels. Many pool owner carry out a weekly pool shock every Sunday evening as this coincides with the end of what is normally a busy period for the pool. Evening is also better than shocking during the day as you avoid sunshine that can deplete chlorine levels. NextBeing indecisive with how to design your nursery?